LED strip is the perfect ‘go-to’ lighting that can be used in pretty much any setting and to any impressive, yet discreet, effect. If you’re looking for the ‘wow’ factor, but want to achieve it in a simple, cost-effective way that’s quick and easy to install, look no further than Collingwood Lighting’s new range of LED strip for every occasion. 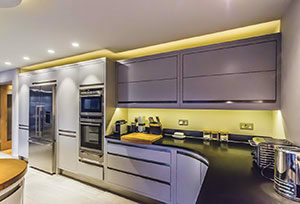 Whether it’s under a kitchen cabinet, around coving in a living room, in a bathroom, or even in an outdoor swimming pool, the new LED strip range has a light for the job. Using the Collingwood simple three-step guide, you can quickly find the LED with the specification you need, based on IP rating, wattage and colour temperature. The IP range from IP20 to IP68 covers every LED strip from indoor use where there’s no risk of splashing to permanent submersion in water. Wattage ranges from 4.8W for task lighting, to 19.2W for high ceilings and exposed beams. This means you can use LED strip for everything from accent lighting to create interest and atmosphere to primary lighting for a room. Every installation is unique and, whatever the desired effect, there is an LED strip for it. Once you have narrowed down the wattage, colour temperature and IP rating you need, the Collingwood LED strip guide will lead you to the perfect light for the job. This entry was posted in News and tagged LED Lighting. Bookmark the permalink. ← GripHero Launch Eco-Friendly Hand-Protection Against the Biological and Chemical Dangers Present on the Forecourt!